← The June 2016 ArrowCreek HOA Newsletter Is Out! a.) Eleven (11) properties were recorded sold in ArrowCreek between 13 May and 21 June 2016 (According to the Washoe County Assessor), up from 7 in our previous report. This brings the total number of properties transferred this calendar year to 38 and over the past twelve months to 82 or 7.6%. A relatively low turn-over rate, still in the single digits, that may be attributed to a general satisfaction with living in our gated community. b.) Three (3) of the properties were on the golf course (the property boundaries actually touch the golf course, not just have a ‘view’ of it). Two (2) were homes that sold for 17% less than the rolling 12 month average for May of $942,738. However, the true selling price, again measured over the past twelve months, decreased to$236.95 per square foot. A slight decrease of $.34 per square foot from May’s value. An additional lot, on the course, was sold for $170,616 per acre. The average selling price for undeveloped property on the golf course now stands at $235,087.41 per acre for the 12 month rolling average. c.) Eight (8) properties were sold that are not connected to the golf course since the May report. This proportion is in line with the number of properties ‘on the course’ versus those ‘not on the course.’ Six (6) homes sold above the rolling average, while one (1) sold significantly below the average. As a consequence, the average selling price of $232.98 per square foot reflected a definite upward trend of $6.29 per square foot or a 2.8% increase from the May value. The sales price 12 month rolling average was $806,685. One undeveloped lot was transferred during this time period. The rolling 12 month average selling price stands at $176,674.72 per acre. d.) ArrowCreek homes have moved to a market rate that remains above that for Demonte Ranch and D’Andrea. So the rise in values appears to reflect the desirability of living within our community. e.) There were two lots sold but a premium remains if the lot has a common boundary with the golf course (33%). This value between the two categories, in general, appears to be following market trends. However, there’s little explanation for the $58,412 per acre difference between the vacant lot purchase prices, as the difference does not show up in the closing home sales prices. However, it is worth noting that there are a very limited number of ‘golf course’ lots versus those not on the golf course. f.) The trends for our property values indicate that over the past twelve months of tracking, the values of homes off the golf course were fairly stable, with the gap between homes on and off the course showing a decreased margin. 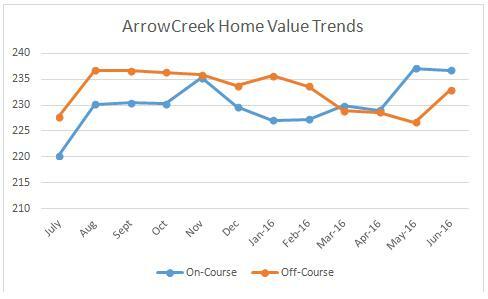 It’s clear from the chart below that ArrowCreek had a ‘soft patch’ between February and April that continued for homes not on the golf course thru May. With spring sales all of our values have risen above those of a year ago. The market continues to strengthen and that bodes well for our community. 2. The housing market in Northern Nevada for existing homes continues to follow economic trends. As the spring selling season is upon us, perhaps we are definitely seeing a boost to our unique community.